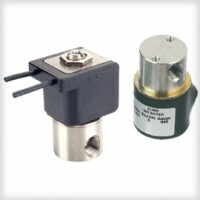 The B Series is a direct acting miniature solenoid valve, available in 2- or 3-way functionality. Like all of our valves, the B Series has bubble tight plunger construction and is designed to last for millions of cycles in general purpose liquid, gas, and vacuum applications. The B Series is available in various orifice sizes, a variety of body materials, wattages, and coil construction for the utmost adaptability to your application requirements. The B Series is an excellent choice for most general-purpose applications requiring a CV of 0.018 to 0.430.